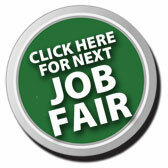 Job fairs are a great place to meet prospective employers. Treat these events as viable options to find your next employer. Know beforehand where the job fair is and what time it starts. Dress just as you would for a job interview and have copies of your resume at hand. The person manning the booth may actually be in a position to hire you. If you’re rude or dismissive, you won’t get hired. You’ll never know what great positions may be open at a company you haven’t yet considered. Some fairs include informational sessions on resume writing, networking and other important job-seeker topics. Each person at every table should get a polite greeting, hand shake and a look in the eyes. Each should be treated as though they hold the key to your dream job, because you never really know if they do. Prioritize according to companies in which you have interest, but don’t ignore any options. Know what you’ll say before you set foot in the job fair. Essentially, your job is to “sell” people on you as an employee, so it’s a good idea to prepare a solid mini-presentation in mind. Be confident and don’t stumble over your words as you let people know how fantastic you are.